The electron transport chain is the final and most important step of cellular respiration. 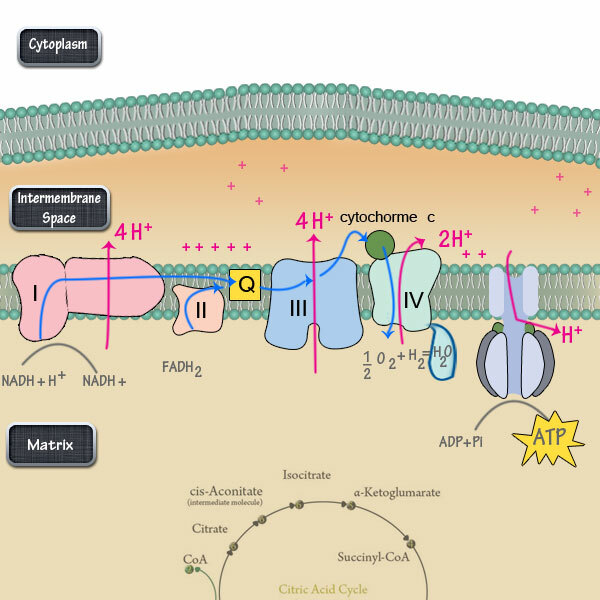 While Glycolysis and the Citric Acid Cycle make the necessary precursors, the electron transport chain is where a majority of the ATP is created. 34 ATP are made from the products of 1 molecule of glucose. This electron transport chain only occurs when oxygen is available . 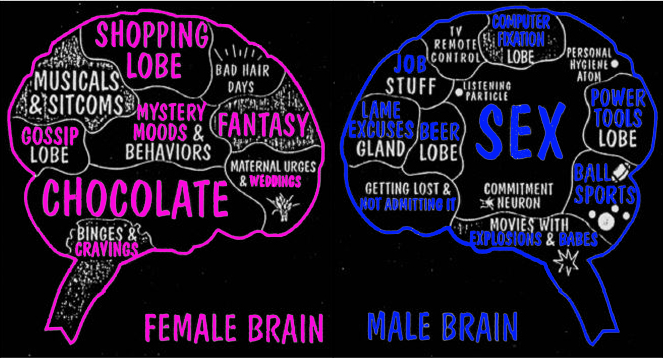 This is shown by the diagram below. Complex I-IV each play a role in transporting electrons( hence the name electron transport chain), and establishing the proton gradient. The exact mechanism of each Complex can be overwhelming so I will save that for a future post. The only thing you should be concerned with is as electrons pass from complex to complex (blue arrows) they power the movement of hydrogen atoms (red arrows) into the intermembrane space. The number of hydrogen atoms (also called proton gradient) will build up and flow back to the matrix simultaneously powering the production of ATP. We learned this principle from general chemistry. The movement of molecules from high to low concentrations requires no energy. This free source of momentum can be used as energy. In the case of the electron transport chain the momentum is used to make ATP. But how do these protons and electrons make it inside of the mitochondria? 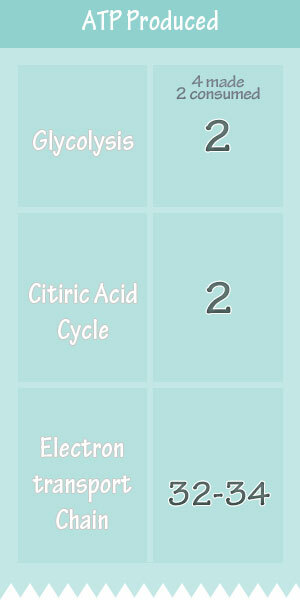 Both the Citric Acid Cycle and Electron Transport Chain take place in the mitochondria. NADH just floats over to the inner-membrane and can enter the ETC at complex I, while FADH2 enters the the transport chain at complex II. NADH and FADH2 are known as electron carriers. This means they are capable of donating electrons to the transport chain. While the electron transport chain’s main function is to produce ATP, another important byproduct is water. If you follow the path of electrons (blue) and protons(pink) you might notice that they follow the same basic pathway until the point where ATP is produced. At the end of the chain the electrons are taken up by oxygen molecules to make water. This is why oxygen is known as the final electron acceptor. To put things in perspective think about how we breathe in oxygen with our lungs, transport it with red blood cells in our arteries to cells, and oxygen is ultimately used inside the mitochondria of every cell to accept electrons at the end of the electron transport chain. If oxygen were not there to accept electrons they would just leak out into the cells and cause all sorts cellular damage that could kill our cells. Luckily our cells can recognize this an revert to anaerobic respiration. If you are familiar with anaerobic respiration and glycolysis you know that lactic acid will be produced. So the next time you are playing your favorite sport and your muscles start to hurt you should realize that you have depleted your supply of oxygen to your muscles and they have reverted to anaerobic respiration. Also you are making significantly less ATP. While we know the role of the electrons in water production, the protons are shuttled back into the matrix and allow ATP sythase to make ATP. An analogy for the last step of the electron transport chain is a fan at the bottom of a staircase. The cord must run down the staircase and represents the flow of electrons building momentum. Once at the bottom of the stairs the momentum built up reaches the fan causing it to spin. Likewise in our cell, ATP synthase also make a spinning motion as it powers ATP production. This process happens in the mitochondria of Eukaryotes and cell membrane of Prokaryotes (click here for a brief explanation). The last key point to remember is this only happens in aerobic conditions( oxygen present). If there is a shortage of oxygen cellular respiration will take an alternative pathway at the end of glycolysis resulting in the the production of lactic acid and ATP. I think this is even better than KhanAcademy! Thank you for making this, and please keep up with the great mnemonics! No problem. good luck with your class. I want to know why 4 hydrogen ion pumped out from nadh dehydrogenase? I really appreciate if you give the answer. I just cant get this !! Great, thanks! Good review as I’m getting back into biology. Quick comment – ATPase != ATP synthase. 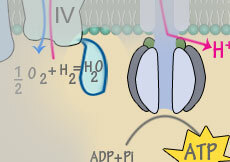 ATPase catalyzes ATP -> ADP such as the Na+/K+ ATPase while ATP synthase is involved in ETC.